Everything changes with Jeses’ Resurrection. No longer do “we look for the living among the dead” for Christ is Risen, Christ is risen indeed! Death is destroyed in the final analysis and eternal life in Christ is now possible by faith in Jesus. It also means the life Jesus calls us to live is true. He has Risen; he is the way, the truth, and the life. We are called to love our neighbor, the poor, and even our enemies. We are called to love God most of all, more than anything else. Thank God for his grace and mercy and forgiveness offered in Jesus. Rejoice in Jesus and live in his grace and love the life that is truly life. Starting with 2 Samuel we see David with the chosen men of Israel moving the Ark of the covenant and celebrating joyously having retrieved it, to take it to the city of David. Their rejoicing quickly turns to fear when Uzzah is struck dead by the LORD for being so brazen as to reach out and steady the ark when it begins to fall from the cart. Only the Levites can touch the Ark, this is the law, Yhwh does not need Uzzah’s help. After three months David understands God’s reasoning and greatly rejoices in it. In Luke we are told of the women coming to the tomb early in the morn after the sabbath, to find it empty and greeted by two glowing men who ask, “why are you looking for the living One among the dead?” They then run to tell the good news to the eleven and the rest; they are greeted with stubbornness and disbelief. Then Peter goes to see for himself and marvels at what has happened and goes home. In the Psalms passage, David praises the LORD for, as he describes it, becoming his salvation. I think the more accurate view would be that Yhwh had always been his salvation and David just realized it. At the end of this section David pens “the stone which the builders rejected has become the chief corner stone. This is the LORD’s doing, it is marvelous in our eyes.” This is an obvious Messianic phrase looking ahead to the salvation to come through Jesus the Christ. In each of these passages the theme seems to be unbelief turning to belief as they looked intently into the actions and words of the LORD. What seems so unfamiliar and unexpected to us is really quite normal to God. He operates in a different economy than we do. He keeps his word. His promises are eternal. He does not need our help or guidance to accomplish His works. When we are transformed by the renewing of our minds into understanding God’s ways we, like David, can say ” this is the LORD’s doing it is marvelous in our sight.” God is spirit, those who worship Him must worship in spirit and in truth. Now that we have passed the Easter Season, a time of sadness and then joy, we need to look at the continuing Christian Year. There is much to learn for each of us to deal with our own circumstances in all of Scripture. I get excited when I open my Bible and the verses I read immediately direct me to a song. Our Psalm reading today gave me that experience again. What a wonderful gift God gave in music as it helps us hide his word in our hearts. This is the song that I began singing upon reading Psalm 118:1-2. What songs do you hear as you read God’s Word? A couple of weeks ago I subbed for a high school “Foods and Nutrition” class. The students were taking a quiz on baking, so I looked through it to see how I would do. (I would have passed!) One of the questions dealt with the difference between chemical and non-chemical raising agents. In some baked goods we add yeast, baking soda or baking powder. But in others, like Angel Food Cake, air and water already present in the ingredients produce enough of a reaction while in the oven to cause the cake or bread to rise. In a way, this is like Paul’s words to the Corinthian church when he encourages them to worship like unleavened bread–born of sincerity and truth. Instead of looking to add something to ourselves in order to worship and honor God, we only need to let loose what God has already placed inside us–the spirit of truth, and a sincere desire to praise the One True God. Our circumstances and world around us are like the oven, creating the right environment for the reaction to take place: the cake will rise, or our hearts will open to God in praise. Just as there are hundreds of thousands of breads and cakes and cookies to be had, God has created different “flavors” and characteristics in each of us. Allow yours to be expressed and be free to serve and glorify our Risen Savior. To Mary Magdalene (Mk. 16:9-11, Jn. 20:11-18). To women returning from the tomb (Matt. 28:8-10). To Peter, probably that afternoon (Lk. 24:34, 1 Cor. 15:5). To those walking to Emmaus towards the evening (Mk. 16:12, Lk. 24:13-32). To the disciples, Thomas being absent (Mk. 16:14, Lk. 24:36-43, Jn. 20:19-25). On the following Sunday evening, to the disciples, Thomas being present (Jn. 20:26-32, 1 Cor. 15:5). To seven by the Sea of Galilee (Jn. 21). To the apostles and “over 500 brethren” (Matt. 28:16-20, Mk. 16:15-18, 1 Cor. 15:6). To James, Jesus’ half-brother (1 Cor. 15:7). At His ascension from Olivet (Mk. 16:19-20, Lk. 24:44-53, Acts 1:3-12). To Stephen, at his stoning (Acts 7:55-60). To Paul, at his conversion (Acts 9:3-17, 22:6-15, 26:12-19, 1 Cor. 9:1, 15:8). To Paul, at Corinth (Acts 18:9-10). To Paul, at the temple in Jerusalem (Acts 22:17-21). To Paul, later in Jerusalem (Acts 23:11). To Paul, in another vision (2 Cor. 12:1-4). To John, the apostle on the island of Patmos (Rev. 1:10-19). One might easily dismiss one or a few sightings as being delusional. Here, all told, we have hundreds of people that encountered the resurrected Jesus. Any single persons testimony on anything is irrefutable, but questionable. With higher numbers of people testifying to the same experience, the experience is geometrically less questionable. Ah, the beginning of spring break has finally arrived. Ten consecutive days with no school, which means that I can get caught up on the rest of life that I have been putting on the back burner. Ten days to get caught up on some things around the house, get caught up on grad homework, get caught up on grading. Ten days to recharge my batteries. Teachers all around have been looking forward for this time to reset the system to make the final charge to the end of the school year. We have almost reached the much anticipated time of the Resurrection. Before we get to that amazing day, we first have to go through the darkness that was the arrest, beating, and crucifixion. Today, we must walk through the valley of the shadow of death in order to get to the summit of Jesus overcoming death. I wonder, while going through all of the pain and turmoil of the 24 hours between the Passover meal and his final breath, if Jesus had Psalm 23 in mind. “Though I walk through the valley of the shadow of death, I will fear no evil, for you are with me.” Those would be reassuring words to know that, as bleak as the situation may have been, that His Father was with him through it all. One thing that strikes me in the story of Jesus’ arrest, trial, and crucifixion, is all of the different times that people, including Jesus’ disciples, were waiting for Jesus to call down the angels to put an end to all of his suffering and to restore Israel with the mighty powers of heaven. There was Peter with the sword and the Roman soldier’s ear in the garden. The high priests during his trial and at Calvary mocked him and called for him to call down the angels to take away his suffering. But Jesus trusted in the will of his Father, and not the will of humanity. Today we go through a valley in the remembering of the human suffering and death of Jesus. But we await the celebration of His resurrection, victory over death, the peak, on the other side of that dark valley. I think if you asked the average person what the 2 most important events in Christianity they would tell you Christmas and Easter. If you ask some other’s you may even get the periods of Advent and Lent. 2 times of preparation and reflection, both carrying their own importance and meaning. Christmas time there is hustle and bustle of preparing for the Birth of a King, often overshadowed is the fact that he was born with one purpose, to sacrifice his life for us on the cross. Easter there seems to be a lot of activity around the Bunny and the empty tomb. But really the crux of our religion happens in the next 2 days here. Passover and Good Friday. Without these 2 days we would not have a joyous Easter morn. In recent years Lent and more specifically Passion week have held greater significance in my life. Maybe it’s being involved in the churches music ministry and picking songs and lyrics based on liturgical occurrences, or maybe because as you mature, you develop a greater understanding of the sacrifice that Christ made for us. I was 13 when my grandfather died, in fact he died the day after my 13th birthday. He was 60 and had just had a minor, outpatient surgery. Because he was a kind and selfless man (the reason my mother is the saint she is) he told me not to visit him, so I could spend time with my friends on my birthday. And the day he passed away he had urged my grandmother to go to her hair appointment so she would look nice. He called his best friend and shared some laughs, and then he lay down in his bed and went with Jesus. Did he know? Did he sense his time was coming? Was he preparing those around him? We will never know. What we do know is that we did not have time to prepare, we did not have understanding, we were not ready. Two major events highlight the importance of Maundy Thursday. First is Jesus celebrating the Last supper with his disciples in the breaking of the bread. The second is the act of Jesus washing the disciples feet. What really stands out to me here is the thoughtfulness and love that Jesus displayed. In a time when he could have been stressed out and focused on his impending demise, he instead broke bread with his friends and in complete servitude and humility, washed their feet. He was trying to prepare them, ease them, into a transition period. I can only imagine how the disciples felt, the turmoil probably going through their minds, bartering or bargaining? Wishing they could change it, or get one more day. He spent his last hours of life serving and loving others, as he had done his whole life. He was prepared and wanted his friends to feel comforted in that. It’s easier to replay the last supper, the sharing of bread and wine we do regularly in worship as remembrance and ritual. The second act many of us have probably never given much thought to. Whatever take away you get from this busy Easter season, may you at the least take time to prepare your minds and hearts for the greatest gift he will give us this weekend. His death on the cross, his promise of salvation and his resurrection. Recently I got asked: What do you think about Easter Egg-hunts? Why do people and kids seem to love this type of events? The more I thought about that questions, the more I realizes that there has to be something more than the candy or the pencil eraser found in the colorful plastic eggs! There has to be more! The more i thought about I found myself smiling and at peace about the questions. Maybe the secret of the Easter Egg-hunt that attracts kids and adults time and time again is found on the empty tomb, or maybe on the faces of the two disciples on their way to Emmaus, or maybe on the face of Thomas as he sees his teacher alive before him. Maybe the answer has to do with us knowing and believing the story of God, but also finding it new every year. Maybe our own search for the hope, new life and for faith, maybe that search still has us amazed at what God is doing and why not at who God is. The whole Easter story is full of amazement, of an element of surprise, of faith and hope, but we tend to forget that. So today I would encourage you to meditate on that Easter morning, when the woman rushed to the tomb, when the disciples forgot about the promise made to them, a day when faith met people’s disbelief, a day that changed the game for generations to come. Be amazed at who God is, and what God is doing! Be amazed! We love Fridays, don’t we? In fact, we love Fridays so much, it’s hard to even imagine a Friday being a bad Friday. For most, it’s the last day of work for the week…and the weekend fun can begin. For most people any Friday — is a good Friday. So many don’t understand Good Friday. They see only the brutality of the day…the suffering…killed by people he loved and his death looked like a terrible defeat. Yet, it was a good Friday. But how? Let’s look at just a few. It was a good day because: Jesus took our sins upon himself; Through faith in Jesus, we have eternal life; Through his death, Death, itself, was defeated; His death and resurrection is a guarantee of our own resurrection; In Christ, we are reconciled to God…our sins are forgiven. For these reasons, and more, what was a bad day for one man, was a good day for humanity. But the best part of Good Friday? Jesus didn’t need to do it…no one forced him. “I am the good shepherd. The good shepherd lays down his life for the sheep. … No one takes it from me, but I lay it down of my own accord. I have the power to lay it down, and I have power to take it up again” (John 10:11, 18). Jesus…our Good Shepherd. 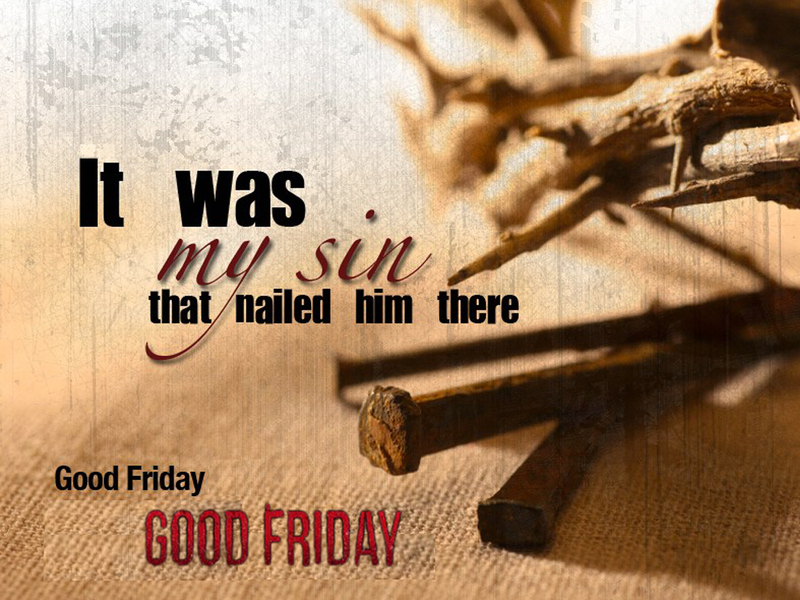 Good came out of the evil on that day, which is one reason why we call it Good Friday.